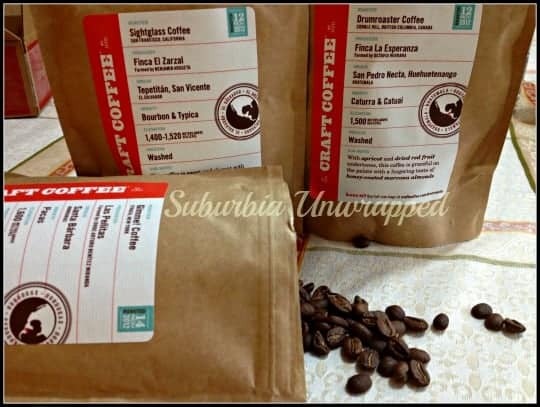 Home » reviews » Gifts for Coffee Lovers: How about a Craft Coffee Subscription and 10% off code? Gifts for Coffee Lovers: How about a Craft Coffee Subscription and 10% off code? Craft Coffee pioneered a new kind of coffee-of-the-month subscription. It brings you coffees from dozens of different roasters with an unprecedented focus on quality. The Craft Coffee experience is simply not available anywhere else. Craft Coffee Tasting Boxes allow you to sample three different super premium coffees from roasters around the country every single month. Their coffee industry experts taste literally dozens of coffees and hand-select only their absolute favorites to include in your Tasting Box. These are not your garden variety grocery store coffees! These are high quality coffees that are painstakingly sourced and lovingly crafted into the perfect flavor profiles. The companies who participate in the Craft Coffee tasting boxes range from tiny little startups to award winning micro roasters but every bag of beans that goes into the tasting box is a high quality blend that was hand picked as one of the best. 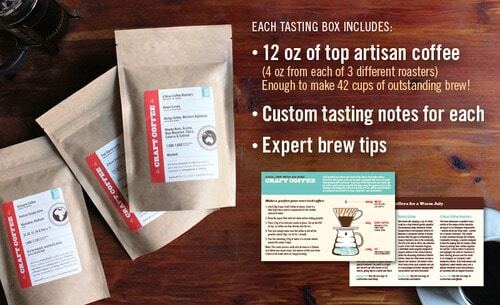 In each tasting box, you will receive 12 ounces of coffee, 4 ounces of three different varieties. You will also receive tasting notes for each one to give you an idea of how to enjoy it. Tasting boxes always ship on the third Monday of the month and you get discounts for buying multiple months at a time. While whole bean is the recommended way to order this coffee, if you don’t have a grinder and prefer ground coffee instead you can choose from a few different grind options. Watch the video below for more information about how Craft Coffee works and head over to the Craft Coffee website to learn more about their great subscription gifts for coffee lovers. The greatest part about this coffee subscription? If you fall in love with one of the coffees in your tasting box you can go back to Craft Coffee and buy a full sized bag! This is a great way to find unique coffees to enjoy without wasting huge amounts of money on full sized bags of coffee that you may not actually like. In my tasting box I got 4 ounces of coffee from San Francisco’s Sightglass Coffee that is described as “sweet and elegant with notes of fresh leather and pine. The silky body finishes in milk chocolate” . There was also a bag of coffee from Drumroaster Coffee in British Columbia that is described as having “apricot and dried red fruit undertones, graceful on the palate with a lingering taste of honey-coated marcona almonds. 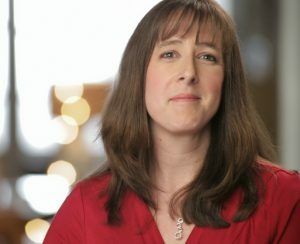 ” The last blend I got to try was from Gimme! Coffee in Ithaca, NY. It is “Full-bodied yet smooth, defined by midnotes of pineapple and cane sugar, with a creamy base that carries into a clean, sweet finish. ” While I cannot say that I taste every undertone and note described by the coffee experts who work at Craft Coffee, I can say that these are excellent blends that will make a beautiful cup of coffee. This is not your giant mug of Quick Trip coffee in a Styrofoam cup! These are blends for people who really appreciate good coffee and I really think that subscriptions to Craft Coffee would make great gifts for coffee lovers on your holiday gift list! What gifts for coffee lovers are you going to buy this Christmas? I definitely have a coffee lover in the house. She even got me hooked on the stuff. The only specific gifts i have in mind this year is to keep the house stocked with coffee!